By our fourth day on the river, the skies had cleared, the river had widened, and the now smooth current did most of the work. The sections where the shoreline turned to jagged cliffs and pinched the ever broadening river, the water dropped its calm demeanor and transformed into an angry frothing torrent full of hazards. Ahead of us that day were the three largest series of rapids we would encounter. 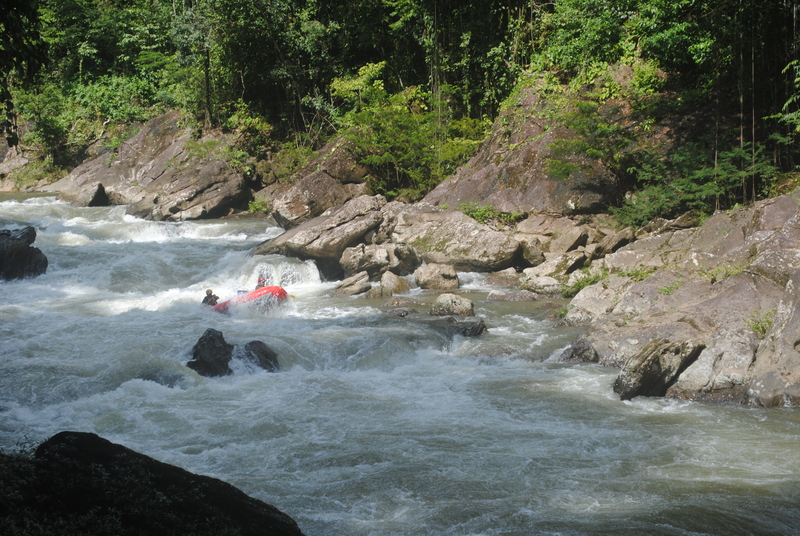 They were too dangerous to risk our supplies or the inexperienced rafters aboard, so we portaged while Jorge and Umberto navigated the class-five rapids. 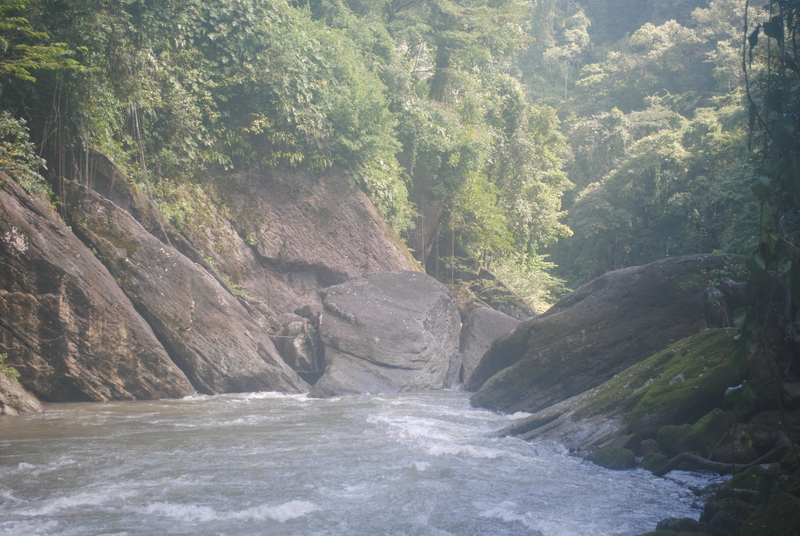 The first and the largest portage, El Subterranneo, forces the Rio Platano under huge volcanic boulders spitting out the river into yet more treacherous rapids amidst huge volcanic rock. A Tayra (Eira Barbara) greets us on the bank as we unload our gear to portage. An omnivore, it is about two feet long (not including its long tail) and looks similar to a weasel. Although we are within 30 ft of the creature, the roaring rapids dull its senses and the Tayra continues to go about its business. Each individual step required careful precision as we clamored along the treacherous rocky outcropping balancing our gear whichever way we could. After several more trips transporting the supplies we waited expectantly for Jorge and Umberto to reappear from the foamy storm below. Several minutes passed before a flash of red appeared from behind the massive stone banks. 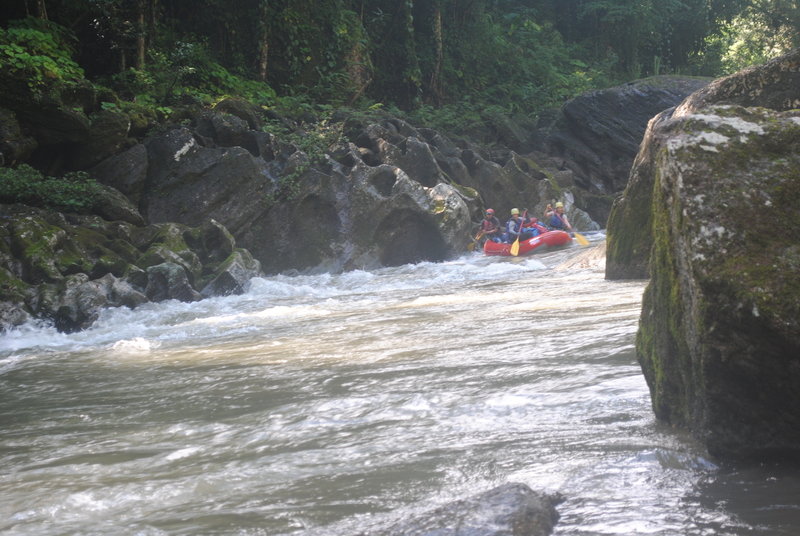 Their raft bucked and shook as their paddles were met with the tremendous force of the rushing water. A small eddy provided a brief break from the chaos of the rapids and an opportunity to scan the water for the least perilous route out. They rested momentarily before charging back into the cascading flow. 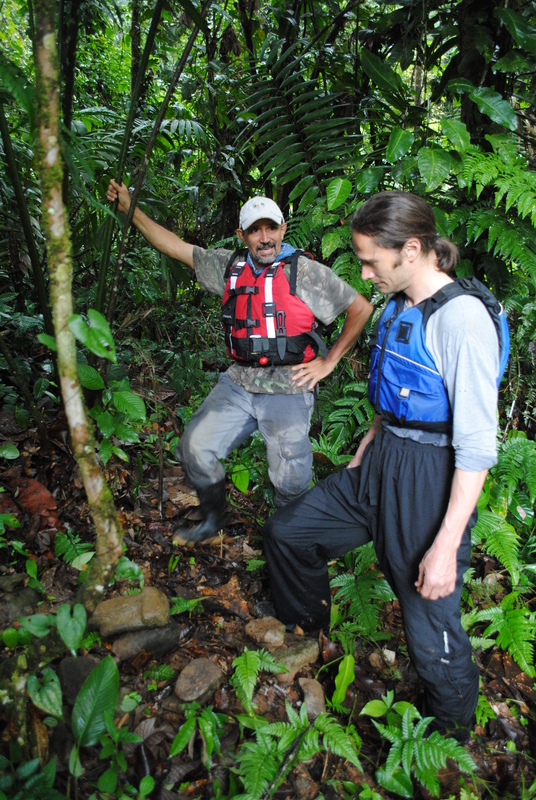 Upon reaching the still waters below, Umberto and Jorge wasted little time climbing ashore and hiking upstream to repeat the process with the second raft. They would do this two more times that day. Between the hazards of portaging we took advantage of the relative calm, warming ourselves under the tropical sun and scanning the shores for movement. We spotted our first troupe of spider monkeys swinging from tree to tree, some with young clinging to their backs and bellies. 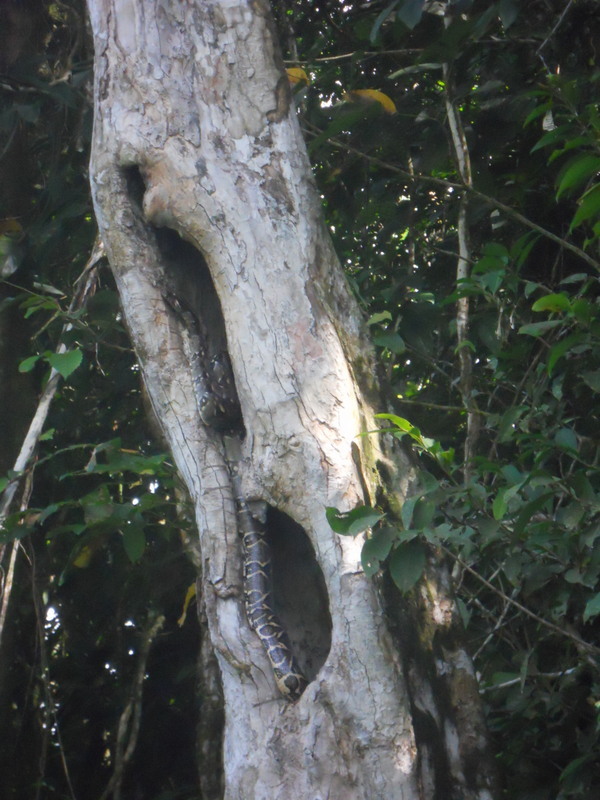 Further down river, an odd pattern on a dead tree became a boa constrictor as our curiosity brought us closer to shore. Its body protracted several feet along the trunk from inside a rotted out hole, its pointed head facing the approaching visitors. Although it kept a cautious eye, the boa showed little sign of shyness. It let us stare for several minutes before retreating to its dark hollow. The next morning, feeling knots in our stomachs from another dose of daily breakfast pancakes and mid-day peanut butter sandwiches, we casually mentioned to Jorge that it was too bad we hadn’t been able to find any wild edibles. While the jungle is full of all varieties of fruit trees, the birds have an incredible knack for getting to them first. Always the good host, Jorge asked Umberto get us the next best thing. Umberto stepped only a few feet away and hacked down the nearest palm. The tough outer fiber was peeled away until only a white center about 8 inches long remained. The sweet and crispy freshness of the heart of palm was exactly what we had been craving. Arriving at camp in the late afternoon, we all got busy with the myriad of tasks involved in setting up camp in the jungle. It takes several hours to move the rafts to high ground, string up the tarp, unpack supplies, set up the tents and prepare dinner for several hungry campers. Though everyone contributed to the effort, the lion’s share of the work was always completed by Umberto, our native Pech Indian guide. 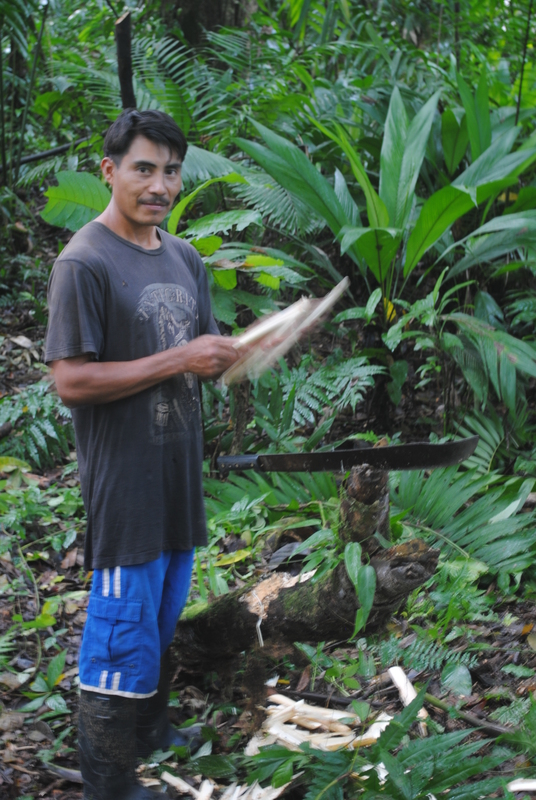 Barefoot and swinging his machete furiously, hacking trees four inches in diameter as if they were blades of grass, Umberto could clear a year’s worth of underbrush in minutes. At the end of the massacre, the firewood was cut, our tent stakes were made and neatly laid palm fronds marked the best areas to set up tents, all courtesy of Umberto’s huge blade and gentle precision. Soon after he would be catching fish on the river with merely a line and hook only to spend the next hour cleaning dozens of small fish with a flashlight pinched between his head and his shoulders. As a man with little ambition for money, I wondered with admiration what sort of inspiration kept Umberto so humbly busy. 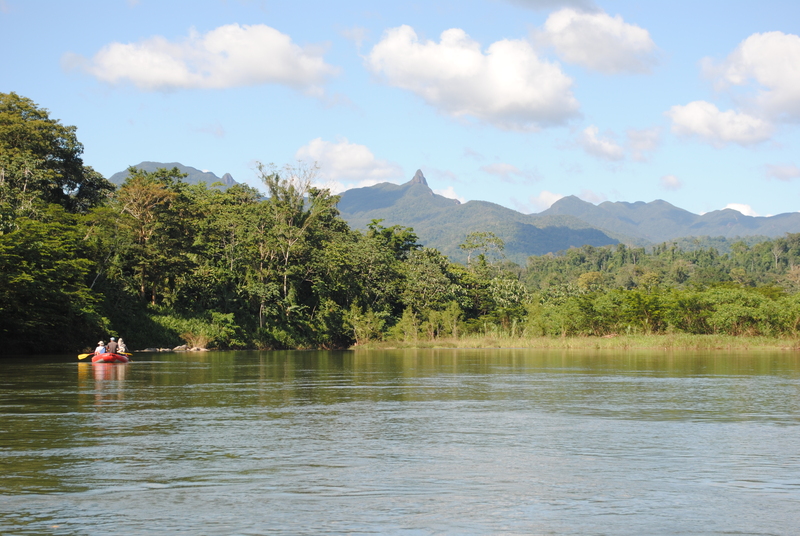 It is not known for certain how long Umberto’s ancestors have been living along this river, though groups of the Pech could date back to as early as 300 CE in the La Moskitia region of Honduras. 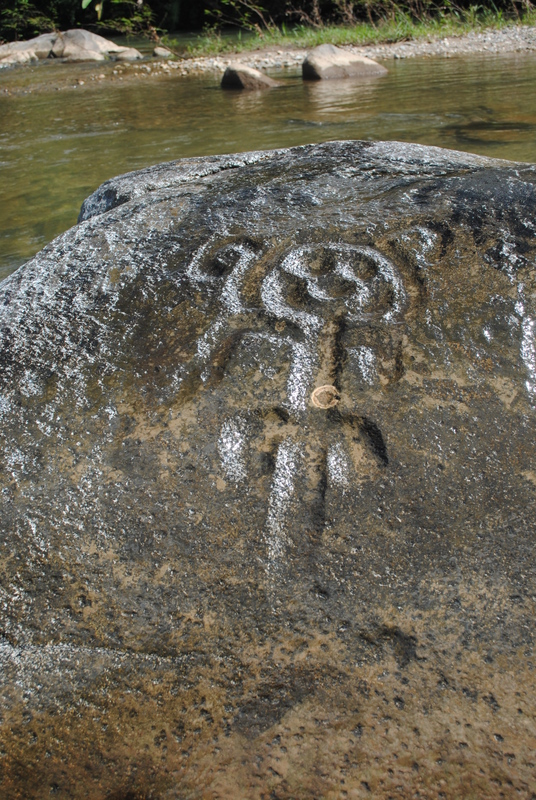 As traditional hunter and gatherers, they prayed to spirits of the mountains and many animals as well as to a mermaid who cares for the river’s fish. 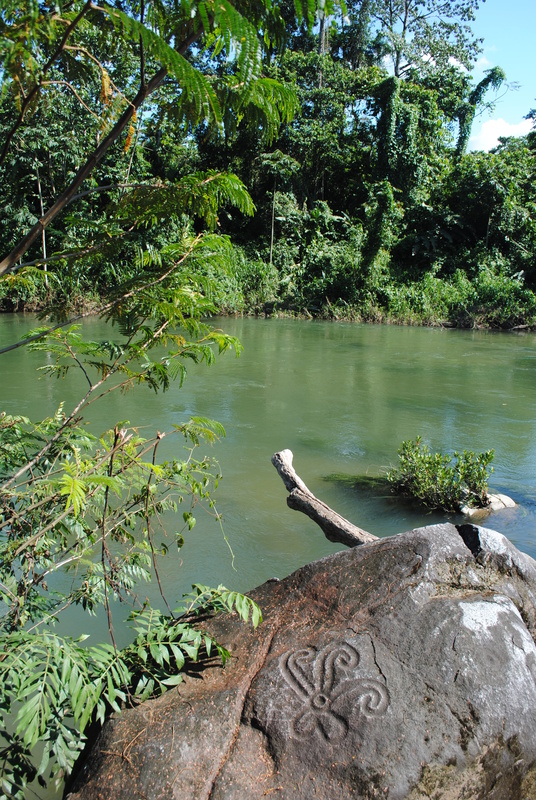 Due to the predominance of Mayan culture in Central America, the Pech territory has remained largely overlooked by academics and little is known of the Pech culture’s history. 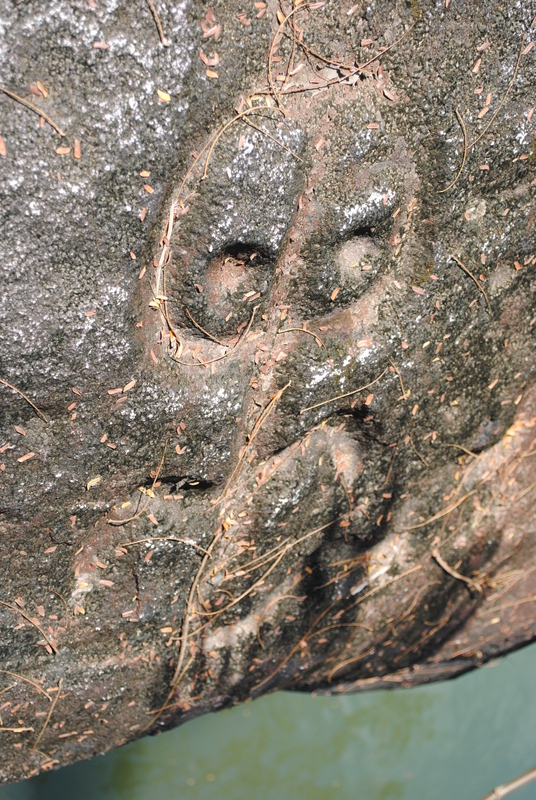 Locals know of several archeological sites which have yet to be studied and countless more remain undiscovered. On this particular day we had the opportunity to visit one such site. 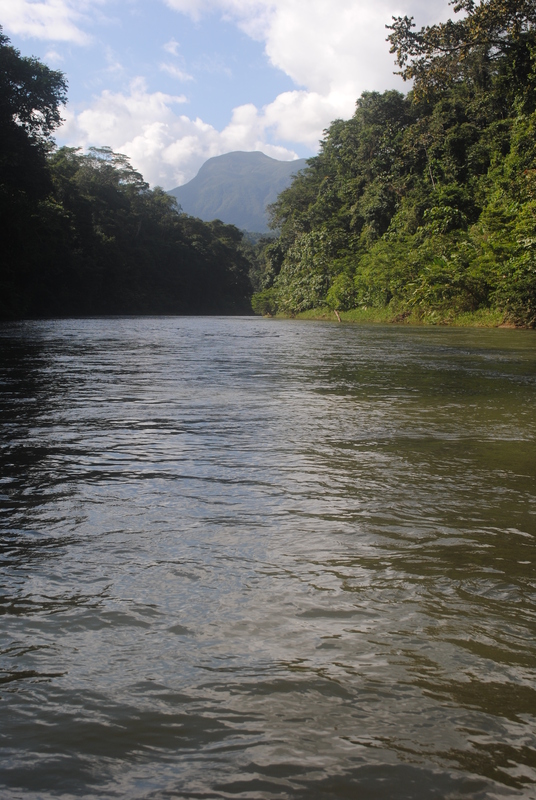 Tying up our rafts on shore, we walked about fifty yards into the thick jungle. Strewn across the ground were more than a dozen grinding stones of different shapes and sizes. 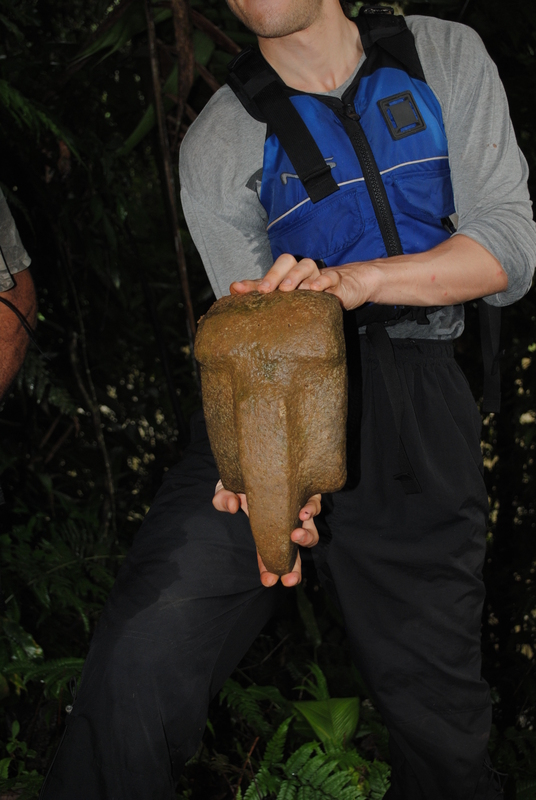 Heavily weighted and remarkably used, they were likely carved while sharpening hunting tools. Feeling significantly weakened after only seven days it was hard to fathom how indigenous life could endure this jungle but watching Umberto glide barefooted with ease down the sharp rocky trail shed some dim light on the issue. Back in the raft the sun was bright, and the cool water felt invigorating as we dangled our bit and blistered feet over the side of the raft. 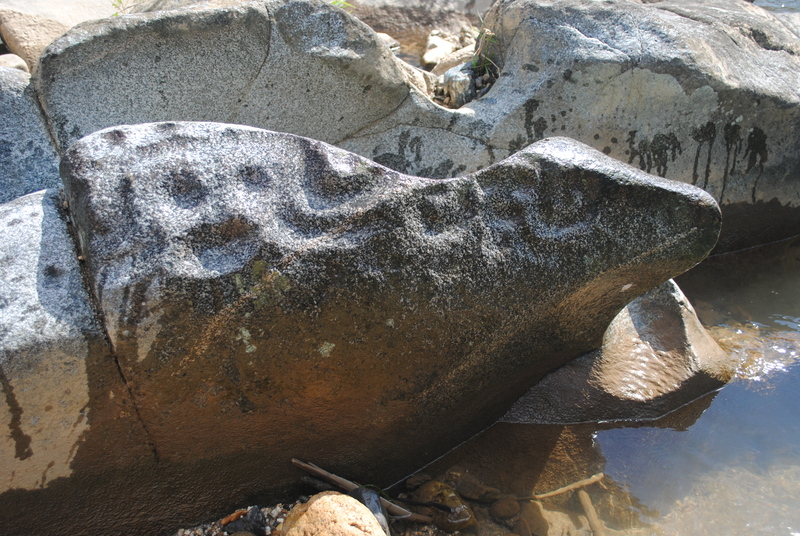 We occasionally floated past symbolic petroglyphs on the river’s massive boulders; more evidence of the ancient Pech culture’s distinguished existence here. A colorful array of birds and butterflies put on a show overhead as troupes of both howler and spider monkeys occasionally joined in. The iguanas continued to belly flop ahead of us and occasionally a curious otter would swim by for a peek. Jorge was, of course, the first to spot a long slithering form on the top of the water. “A snake! Paddle forward!” Jorge shouted with excitement. We were a bit skeptical. It was a big snake. The snake was a drymarchon. These non-venomous river snakes can reach lengths of ten feet and this one was easily six. Meeting the other raft downriver later we saw the same joyful expression in Umberto’s face. “Look how excited Umberto is. They must have seen a tapir!”, Jorge exclaimed. He was right. They had spotted a tapir, which unfortunately withdrew just before we had caught up. Though the Pech no longer actively hunt this massive, pig like mammal, they have an ancient connection to the tapir which has not faded. The site of this creature once meant food for a hungry family, today it is a good sign of the Biosphere’s heath, also a cause for excitement. As we set up camp along a shallow tributary, it started to sink in that our journey was nearly over. 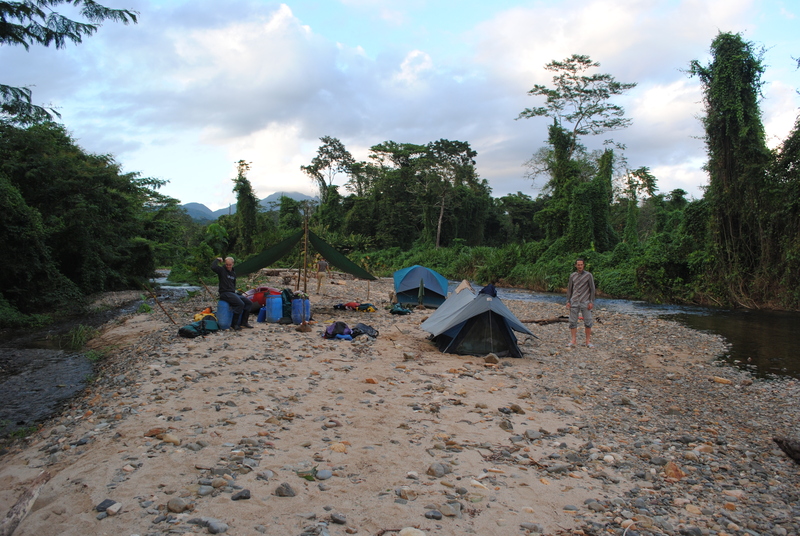 This would be our last night of camping and the following day we would arrive in the Pech village of Las Marias. While we did our best to make the most of the final night by the fire, thoughts of the outside world began creeping into our heads and we regressed to debating which route we’d take to Nicaragua. 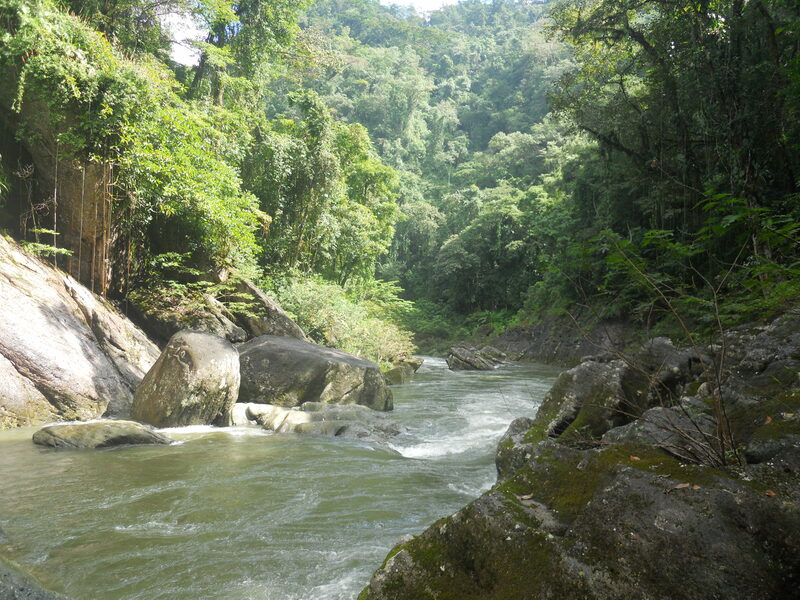 While deep in the jungle it was impossible to concentrate on anything but the immediate with so many things both intriguing and hazardous going on around us, but as we sat on the borders of civilization, concerns of the future entered our thoughts. The wilderness however had one last amazing show for us. For the first time in the trip we were camping out from under the canopy below clear skies. Lying on our sleeping mats, listening to the water swish by us, we were captivated by the stars above us, we had never seen the night sky so luminous and pronounced.